A quilt is a special gift, one that can spread comfort to those in need. Just take a look around our own community and think, ‘who needs a quilt?’ Homeless shelters, women’s shelters and hospitals are a great place to start. United Way of Pierce County has been procuring items for individuals and families in need in our community for many years and there are a number of local businesses and donors who have contributed. 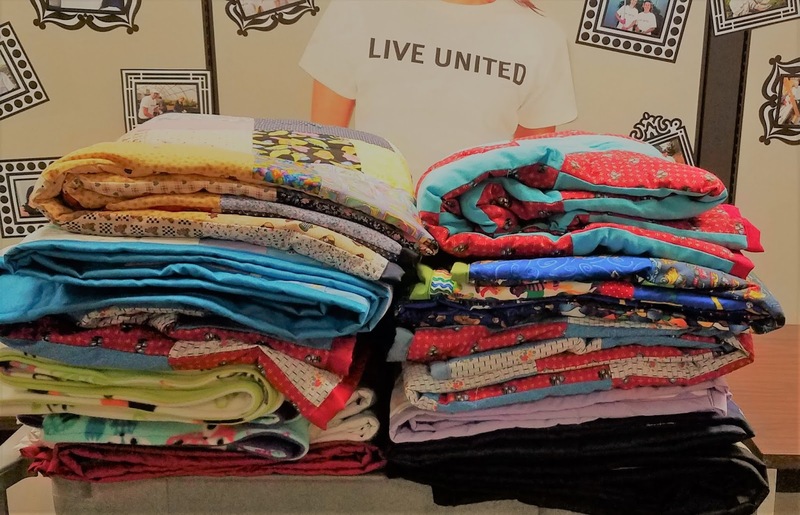 However, few of the donations are as personal as the gift of homemade quilts pieced together by two secret sewing angels, who have taken their passion in pursuit of providing comfort. 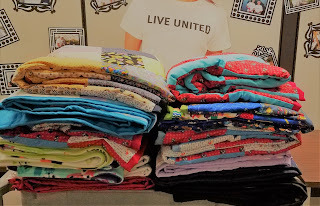 As you can imagine, it takes time, effort and money to make these quilted blankets. However, the quilting duo (who chose not share their names) think everyone deserves sweet comfort, especially members of our community who may be forgotten or overlooked. For the past several years, they have applied for and received grants through the Thrivent Financial Group, which is a Lutheran financial and insurance company based in Minnesota. They receive these grants through a special program they call Thrivent Action Team Projects. These monetary stipends assist in accomplishing community-based project goals and objectives. On a related note, we are sad that Phyllis will be retiring in June after more than 10 years with United Way, but we are so happy that she will be pursuing personal dreams. Phyllis has made a herculean effort in acquiring donations from companies that include the Men’s Wearhouse, IKEA, Bed, Bath and Beyond and other regional businesses as well as member organizations like churches and women’s groups and of course, local families. If you or someone you know would like to make a gift of new or unused clothing, office furniture, home furnishings, appliances, toys, bedding and toiletries, please contact us at 253-597-7485. We have received these blankets at The Salvation Army homeless shelter and the families and women LOVE LOVE LOVE them. They don't feel like an institutional, shelter blanket. It has been a wonderful blessing to so many people!